Susan La Monica, Chief Human Resources Officer, on the importance of giving back and teamwork. Susan La Monica, Chief Human Resources Officer, on the power of teamwork and giving back. 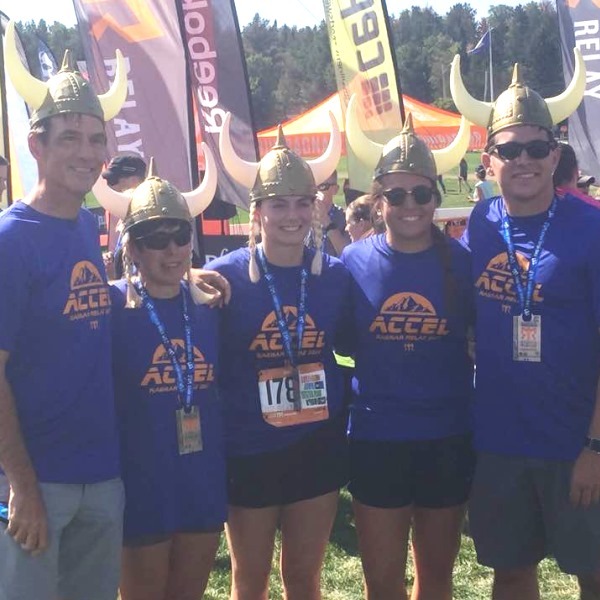 After an exhilarating Credo celebration, I was able to cap off the week by conquering the Ragnar Relay – an approximately 200-mile run from Saratoga Springs to Lake Placid, NY with eleven other runners, including my three kids and their friends, all 20 to 26 years old. We ran the race to raise money for the Adenoid Cystic Carcinoma Research foundation, based in Needham, MA, which has personal significance for our family. ACC is a rare form of cancer that receives little attention and therefore little funding. We began our fundraising effort back in the early part of the summer with a goal of $15,000. I am happy to say that as of now we have raised more than four times our goal! We began the race traversing our way through the grueling (lots of long unforgiving hills) but beautiful terrain of the Adirondacks until we reached the finish line near the iconic Olympic ski jump in Lake Placid. As a team, we ran continuously over 28 hours with each runner running three legs of the race. Sleep was at a premium, and we were able to grab one to two hours of shut-eye. While some team members had the comfort of sleeping in the van, others chose to sleep under the stars. I led the team off at 8:00 am on Friday for 5 miles, then ran again later that day at 6:00 pm for another 4 miles, and then had my final run at 3:30 am on Saturday for 5.3 miles, 2 miles of which were a continuous uphill climb! Thankfully the complete darkness masked the steepness of the terrain and a beautiful night sky filled with thousands of stars created a welcomed distraction. Although this was a "race" and there was a winner, it really was a weekend focused on community, supporting and helping your team and other teams, and pushing your limits physically and mentally. It felt like such an appropriate way to extend my Credo Week celebration in true Citizens style, supporting the amazing work of a little known not-for-profit. I start this week feeling accomplished and energized, thankful for being part of Team ACCel and Team Citizens and grateful for the encouragement and advice I received from many of you along the way. Learn more about life at Citizens.